These are classic poolside chairs seen beside pools all over SW City and are perfect for soaking up the Suns rays 24/7. 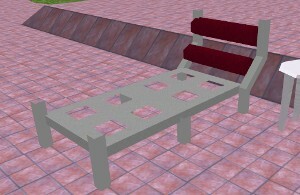 There are no oddly rotated parts on this chair, so you can select the entire thing and rotate as needed. Place the base object where you want the middle of the chair to be. When placed, the chair will face south so rotate as needed.